Bonn, 10 May 2017 - Migratory birds face an increasing number of threats while traveling huge distances. Their intercontinental flyways include key stopover sites that are essential for migratory birds to rest and refuel before continuing their journey. 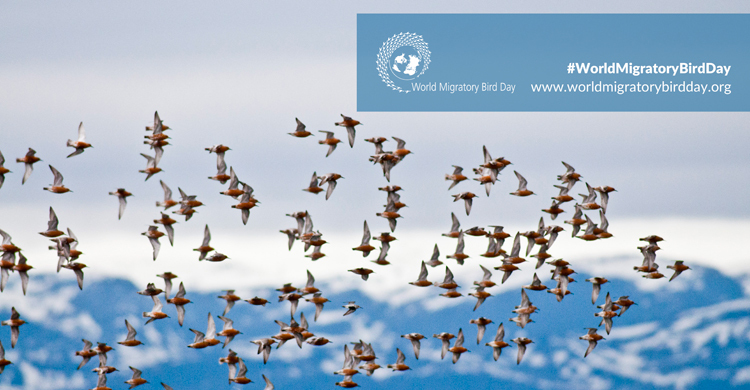 Celebrated in over 70 countries on or around 10 May, World Migratory Bird Day 2017 highlights the need for international cooperation to conserve migratory birds and their habitats for the benefit of mankind. The theme this year is “Their Future is Our Future – A Healthy Planet for Migratory Birds and People” which is closely linked to the UN Sustainable Development Goals. The Convention on the Conservation of Migratory Species of Wild Animals (also known as CMS or Bonn Convention after the city in which it was signed) aims to conserve terrestrial, aquatic and avian migratory species throughout their range. It is an intergovernmental treaty, concluded under the aegis of the United Nations Environment Programme, concerned with the conservation of wildlife and habitats on a global scale. Since the Convention's entry into force in 1979, its membership has grown steadily to include 124 Parties from Africa, Central and South America, Asia, Europe and Oceania. CMS and its related Agreements on migratory birds bring together governments and other stakeholders to coordinate and further develop conservation policies, to ensure that all flyways in the world benefit from coordination mechanisms that promote cooperation at ground level among the countries involved. The Raptors MOU was concluded under CMS as a special instrument to address threats to these species. The Agreement on the Conservation of African-Eurasian Migratory Waterbirds (AEWA) is an intergovernmental treaty dedicated to the conservation of migratory waterbirds that migrate along the African-Eurasian Flyway. The Agreement covers 254 species of birds ecologically dependent on wetlands for at least part of their annual cycle. The treaty covers 119 Range States from Europe, parts of Asia and Canada, the Middle East and Africa. Currently 75 countries and the European Union (EU) have become a Contracting Party to AEWA (as of 1 April 2017).